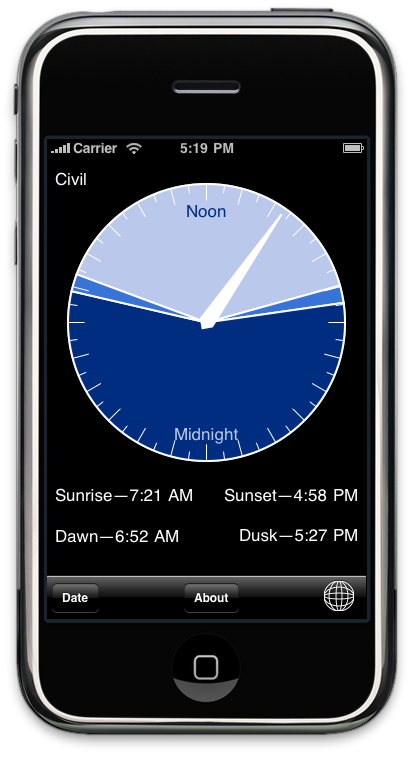 Display sunrise and sunset times for your current location, at any point in time. This application will use your current location to compute sunrise and sunset times, as well as twilight period for Civil, Nautical and Astronomical twilight. Perfect for photographers who want to prepare for the "Golden Hour", for bike riders who want to be home before nightfall or for amateur astronomers. My name is Philippe Casgrain and I wrote Daylight. I occasionally blog about software development topics at developer.casgrain.com. Copyright © Philippe Casgrain. All Rights Reserved.